The flag of Rouen is blue with a vertical red stripe along the hoist, "Rouen" written in white letters and a yellow silhouette near the fly. The silhouette represent the Paschal lamb, from the coat of arms of Rouen. The red, blue and golden logo of Rouen was unveiled by mayor Pierre Albertini on 9 September 2003 (Rouen Magazine, No. 190, 1 January 2004). The former flag of Rouen was vertically divided blue-red with the municipal coat of arms in the middle. The Grand Port Maritime de Rouen is managed by the Port of Rouen, a public government organization under the surveillance of the Direction générale des infrastructures, des transports et de la mer (DGITM) (General Directorate of Infrastructure, Transportation andSea), which is under the jurisdiction of the Ministère de l'Écologie, du Développement durable et de l'Énergie (MEDDE) (Ministry of Ecology, Sustainable Development and Energy). The flag of the Port Authority (photo) is white with the authority's logo. The Maritime, Fluvial and Harbour Museum of Rouen (Musée Maritime Fluvial et Portuaire de Rouen; website) is a museum dedicated to the history of the port of Rouen. The museum opened in 1999, during the Rouen Armada (website), a festival of tall ships first held in 1989, which takes place every five years. The flag of the museum is light blue with the museum's emblem in the middle. 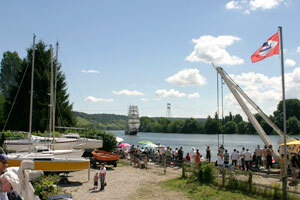 Cercle de la Voile de la Seine-Maritime (CVSM; website), headquartered in Rouen, was established in 1931 by a group of yachtsmen from Rouen, on the model of Cercle de la Voile de Paris and Yacht Club de l'Île-de-France. The club house, located in Saint-Pierre-de-Varangeville, upstream from Duclair, and still in use today, was inaugurated on 5 July 1931 by Alphonse Rio (1867-1949), a former captain in the merchant navy, Senator for the department of Morbihan (1924-1940), Deputy State Secretary of the Merchant Navy (1921-1924) and of the Navy (1930), and Minister of the Navy (1930-1931; 1939-1940). A lunch was served to 250 guests, followed by a regatta on the Seine ran by 37 sailboats and watched by more than 1,000 people. The flag of CVSM (photo)) is red with a white diamond charged with a black Norsemen longship, recalling the remote origin of Normandy and Rouen. The burgee of CVSM is a triangular version of the flag, but here the diamond does not reach the edges of the flag. When members of the CVSM decided to adopt a one-design sailboat, the model proposed by Victor Brix won the contest. The new boat was named "Caneton" (duckling); the club's tradition says that this name was coined for the meal served during the meeting aimed at finding a name for the boat. The first Caneton boats sailed in 1932 and were soon adopted by other yacht clubs invited to regattas. From 1932 to 1945, more than 700 Canetons were produced. On 2 February 1947, the Association des Propriétaires de Caneton (ASPROCA) decided to drop the one-design for the restriction system. Caneton boats are still produced, with a lower weight than originally prescribed (Brix light model). Number 1,000 was assigned in 1948. Victor Brix proposed a Caneton flag, which was subsequently superseded by a design proposed by Francis Moivet, blue with a yellow duckling. The naval architect Victor Brix (1894-1974) was famous for the thorough elaboration of his drafts, even those that were only preliminary studies, and his imaginative and innovative designs; unfortunately, most of his drawings have not been recorded and his archives were lost in a blaze. An independent architect, Brix designed in 1923 for the Moguérou (subsequently, Jézéquel) shipyard in Carantec the Magda III Breton cutter, which won the first regatta it entered in. His designs were deemed of "perfect quality" by the reference review Le Yacht. Articles published by his friend Charles Price increased its international fame. Brix used to work 15-16 hours per day, 7 days per week; he said "I work for yacht building and not for income". Exhausted and depressive, he killed his mother in 1936; after a stay of nearly 20 years in a psychiatric clinic, he resumed his activity from scratch, numbering his new designs from No. 1 and reaching No. 115 in 1968. Hired by different shipyards, Jézéquel included, or yachtsmen, Brix designed several sailboats, fishing boats, motorboats and tugboats. He wrote also theoretical studies on shipbuilding and restriction systems.